Cestodes are tapeworms that are seen in many species; they may not be host specific. Most have intermediate invertebrate hosts such as beetles or earthworms. It is doubtful if any signs are produced under most circumstances. Occupy space in intestine and create small lesions at point of attachment. Identification of the presence of the worms at post-mortem examination. Flubendazole is effective at a 60 ppm in diet, however it may not have a zero withdrawal in commercial egg layers. Check your local regulations. Control the intermediate hosts, or birds' access to them. Figure 34. 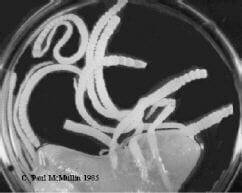 Mature tapeworms with their heads (scolices) embedded in the intestine.